The FEI will debut its first eLeague series at FEI Dressage World Cup™. The Federation Equestre Internationale (FEI), the global governing body for horse sport, has ventured into the new evolution of esports launching its first official digital fan series in partnership with SAP, the world’s largest enterprise application software company. The FEI eLeague Dressage debuts at this weekend’s opening qualifier of the FEI Dressage World Cup™ series 2018/2019 in Herning (DEN), giving fans the opportunity to engage with the sport on a higher level. The FEI eLeague Dressage is the expansion of the well-established Spectator Judging® app, the state-of-the art-mobile application which enables fans to get in the judge’s seat, creating audience scores and rankings in real time. 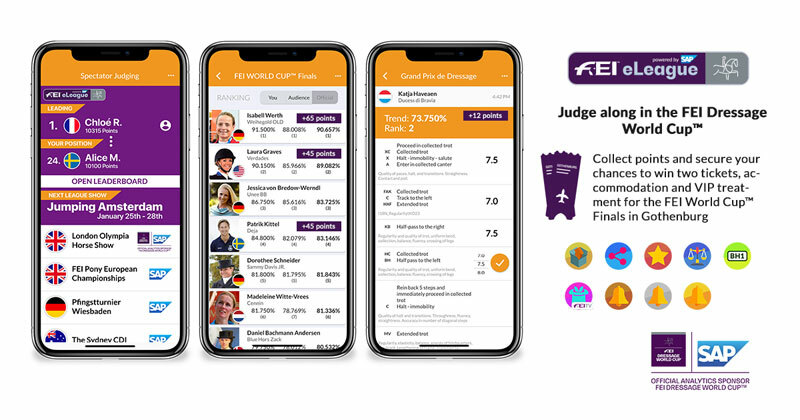 SAP, as the Official Analytics Sponsor of the FEI Dressage World Cup™, has built upon the success of the Spectator Judging® app making fans an integral part of the overall series. The innovation of the FEI eLeague Dressage relies on a new gamified ranking functionality, as users collect points by participating in Spectator Judging® throughout the 2018/2019 FEI Dressage World Cup™ Western European League season, both onsite and online by watching FEI TV. Additional options to collect points will be added over time, for example by interacting with the FEI channels or posting individual user-generated content. The Live-leaderboard on the FEI website will display the current ranking of the eLeague participants as well as in the Spectator Judging® app, so fans can truly enjoy watching their progression on the leaderboard. The overall winner will be announced after the last qualifier in the Western European League season, held at ‘s-Hertogenbosch (NED) 14-17 March 2019. They will receive an exclusive VIP trip for two persons to the FEI Dressage World Cup™ Final in Gothenburg (SWE) 3-7 April, and will have the chance to go behind the scenes, meet the athletes and enjoy the Finals with all the additional excitement this immersive experience brings. Social media: Follow us on Twitter, Instagram & Facebook. The Spectator Judging® app, which runs on SAP Cloud Technology, is the result of a collaboration between SAP and software development company Black Horse One, an official SAP Partner. The FEI and SAP SE joined forces to push forward the FEI’s global fan engagement strategy for equestrian sport in April 2017. Read the press release here. Watch the video on the Spectator Judging® app at the FEI World Equestrian Games™ Tryon 2018 here.